First of all, Babylon Bee is a satire site. Second of all, I just was laughing at this very loudly (inside, at least). Third of all, I pass this along with all due respect to what HRC really is, what kinds of lizard and/or other ET cultures are present on Earth, and many of which may have mated with humans for positive reasons! Posted for humor reasons only. 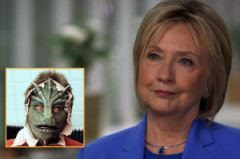 WASHINGTON, D.C.—Shortly after Elizabeth Warren released a DNA test that may or may not show that she is 1/1024th Native American, failed presidential candidate and former Secretary of State Hillary Clinton showed the results of a recent DNA test that conclusively proved she is only 50% Reptilian. The test, conducted by a renowned DNA expert, showed that only 50% of her blood comes from reptilian humanoids from space bent on destroying humanity. Many Washington insiders had claimed she was 100% reptile, but these claims are now known to be a hoax. At publishing time, Clinton had admitted the remainder of her DNA was that of a Cylon. This entry was posted in Uncategorized and tagged Babylon Bee, cabal, energies, Hillary Clinton, Kp, Lizard | Categories: apocalypse, love, new energies, partners in contrast. Bookmark the permalink.